In large soup pot, cook bacon on medium heat until browned. Add onions and celery and cook until tender, about 15 minutes. Add corn, potatoes, milk, broth, and pepper. Cover and simmer for half an hour. Remove from heat, uncover, and cool slightly. Using an emulsifier, puree until it appears creamy with bits - a true chowder. 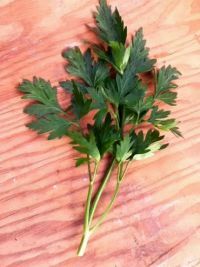 Serve warm garnished with chopped basil or dill. * This is an easy recipe, it feeds plenty, and it freezes very well. Enjoy!